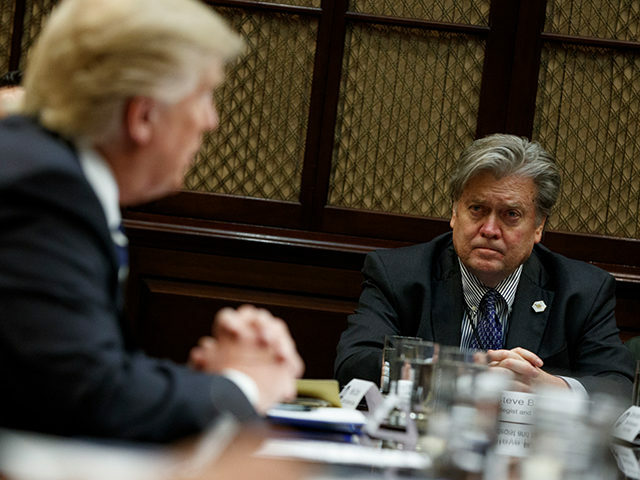 “The President of the United States is a great man,” said Breitbart News’s Executive Chairman Stephen K. Bannon on Wednesday’s edition of SiriusXM’s Breitbart News Tonight. Bannon’s comments came in response to Justin from California, a caller-in to Breitbart News Tonight noting President Donald Trump’s recent criticisms of Bannon. JUSTIN: First of all, I think [Donald Trump] made a huge mistake, Steve, bashing you like he did today on Twitter. That was devastating to me. I hope in the future you can forgive him for that when we come to 2020, because I’m sure he’s going to need your help. BANNON: The President of the United States is a great man. You know I support him day in and day out, whether going through the country giving the Trump Miracle speech or on the show or on the website, so I don’t you have to worry about that. But I appreciate the kind words. JUSTIN: Yeah, that just made me sick to my stomach, though. “[Donald Trump] got sucked in by fake news, or trolled,” said Gayle in Alabama, another caller-in toe Breitbart News Tonight, framing the president as being fooled by cultivated drama via the Hollywood Reporter’s Michael Wolff. BANNON: President Trump, with the whole swamp up there, the D.C. apparatus, the nullification project, everything going on; he is fighting every day. There’s no doubt in your mind, right? And maybe things get off track, or stuff gets said, and all this heated stuff, but however, this is a guy, you voted for him, you supported him, is there any doubt in your mind he’s been fighting for and working for you, the deplorables, the forgotten man and woman, the silent majority, every day he’s been there? GAYLE: I’ve never thought that any of us were deplorables. I thought they all were criminals, because I know who they are. I’ve done the savings and loans. I took down many, I mean, I did the banking work. I do know across the country, I do know the history. We are fighting the criminals in Washington. We are fighting the seventy- and eighty-year-old criminals. We are fighting the people, the Clintons and the Bushes. We do know the history. We are not the deplorables. We are the subdued by the criminals in Washington… I happen to know this country is greater because of a Stephen K. Bannon.